It would seem Troi's Future Ex-Cons are aptly named. This week they and their fantasy QB Peyton Manning stole a victory from the nonames. 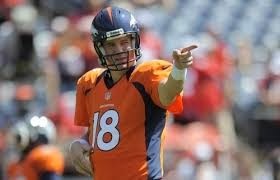 My man' Rodgers' measly 19 fantasy points couldn't hold a candle to Mr. Manning's 45. Even my reserve QB, Eli "Interception" Manning racked up more points than Mr Rodgers with 23. Hey, Rodgers. Pull my finger. My nonames had a bunch of under performing idiots lat week. Victor Cruz amassed 4 points. David Wilson picked up 7 points. Reggie Bush gathered 6 points. What the hell? And while the nonames were pulling themselves up by their bootstraps, the Ex Cons - in particular Manning - were pulling a bootleg. Hell he not only deaked out Dallas but the camera man too! The one bright spot for nonames was WR Dez Bryant who really put in an effort with 30 points, more than double the Yahoo projection for him last week. I don't know if there was a full moon last week or what but the nonames had to hire a fumigator to clean out their dressing room after last week's games because they stank so much. So the Cons are number one and the nonames have slipped into 4th spot. In the coming week we go up against that loopy luddite LOBO and his Predator Press, currently in 2nd place. I sure hope we don't steal defeat from the jaws of victory two weeks in a row. Funny. Joe beat me -"Biggest Blow Out- in the other league last week, and I returned the favor here this week. (BTW I don't think I've ever seen an underdog get BBO) This week I beat you in the other league, and we meet here this week. It's rematch a go-go. When Calvin Johnson was ruled out, I was glad you popped in Dez -that at least mitigated your CJ situation. But I was surprised you stuck with Stafford (minus his favorite weapon) ... given how close our projections were, I expected you to bootstrap a waiver wire QB to tip it in. In any case, see you on the gridiron this weekend. My guys simply sucked. Rodgers won his game in the real world but lost the fantasy points battle big time, for example.